It’s time for the Golden Globes, Critics’ Choice Awards, SAG Awards, Grammy, Oscars… and all the other shows honoring the best entertainment achievements. At their least, they are welcomed distractions from the cold of winter. At their best, the shows are breathtaking tributes to inspired talent and works of art. I feel the same way about the top public sector and government contracting industry awards. They don’t garner the same pageantry as the stars, but industry award announcements still spark a hearty level of buzz and excitement! I’m always interested in seeing which companies and executives make the cut for the various awards in our industry. Awards demonstrate thought leadership for government contractors and their key executives; credible recognition for a job well done. If you’re interested in creating an awards program for your organization, the good news is that there are awards for just about anything. And whether you win an award or are a finalist, people notice. Employees love working for companies recognized as innovative, growing or great places to work. Clients and partners are proud and reassured to work with companies that are recognized for innovation, achievements or vision. Government customers can sometimes share their success stories through awards, even when they’re unable to provide testimonials. Supporting their nomination is a win-win. If they win – or are named a finalist – they are recognized for their (and your) program achievements. And the valuable success data you collect in the process supports your past performance metrics. With so many award options, it can be tough to decide how many – and which ones – to apply for. To decide, start with your brand. Is your organization innovative? Do you have an amazing culture? Are you a small but fast-growing company? Is your leadership team established and visionary? Remember your goals. Are you trying to recruit top tech talent? Look for awards that recognize technology achievements. Planning to enter a new market? 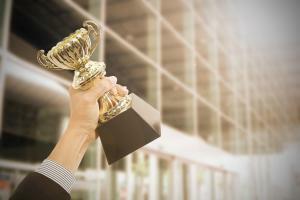 Find awards that call out innovative successes. Select (only) the awards that back up your claims and help you achieve your goals. Every year, Boscobel publishes this compilation of our top 30 awards that recognize the public sector and government contracting industry. Use our list and customize it to create your award strategy and short list for the year, marking the deadlines for each. Then, put yourself in the judges’ shoes to guide your submission. Pull the data you need to support ROI. Take time to craft your story – usually, within 500 to 1,500 words. Judges like organized, simple, compelling stories. Use action-oriented language and customer quotes to bring your success to life. With the right short list and nomination copy, you’re likely to win – or at least be named a finalist. When that happens, share the good news! Press releases, client emails, social media and blogs can all help extend the value of your win, as part of your thought leadership program. Ready to shape your 2019 awards program? If you need support, please let us know. We’re here to help!